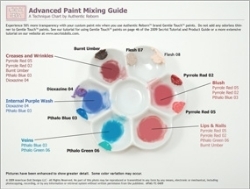 The Paint Mixes Pattern technique sheet comes printed on an 8.5" x 11" gloss paper. Mixing paints has always been a bit scary for doll makers but wouldn't it be nice if they could see a paint palette with all the right colors already mixed? With a photo-type technique sheet they can. Where do you start rooting on a baby head? How far down on the forehead and temple area do you go? Now you can see it all clearly as it was taught in class.